Is Sectarianism Still a Religious Issue in Scotland? As everyone is well aware, it is Scotland’s two biggest football clubs that are seen as the embodiment of the sectarian divide in this country. The pair represent either side of the split. Rangers and Celtic; Protestantism and Catholicism. This has always been the case and it has come to be accepted that football is the vehicle that carries and expresses the views of these two particular sub-sects of Christianity. This is how it is and how it always was. Rangers supporters are Protestants and Celtic supports are Catholics. This is why there is a bitter hatred between fans and it is the root cause of any violence or sectarian related crime. Only it isn’t. At least not anymore. And this misunderstanding has to be addressed. In order to tackle the problem of sectarianism in Scottish society, it is important that we understand it. Without knowing exactly what it is, it leaves those attempting to solve the problem at a disadvantage. With everyone believing that this is still a religious problem, the country is already on the back-foot in the fight against it. In a 2011 census it was revealed that 37% of Scottish people claim that they have no religious affiliations whatsoever; a nine percent increase from 2001. This figure has undoubtedly risen since then, too. This shows that labelling any violence as sectarian related is careless at best. This is now a football problem; not a religious one. Scotland is becoming and increasingly secular society. Religious identity and association is decreasing every year, yet the violence and rivalry is still being classed as sectarian. Writing in The Guardian in 2011, Steve Bruce described the situation in Scotland as two sides with “equally false religio-ethnic identities”. What was once a genuine religious matter with a footballing face has transformed into the opposite. The religious aspect is still used by fans from either side as a form of defence or attack. For example, where other football teams tend to chant or sing to wind up the opposition, Celtic and Rangers incorporate facets of their religious history, in this case religious, to use against the other. The caveat to all of this though is this added layer of tension that makes the Old Firm rivalry one of the very best in world football. Few other matches in football can compete with the passion that carries the fixture. It’s why it remains so popular, despite the overall quality of Scottish football being much lower than it’s European counterparts. The media in Scotland also has a big role in maintaining the narrative of sectarianism in the country. It is a profitable story for the media to tell. A stabbing with a sectarian motive will sell more papers. People are much more interested in a crime if it is labelled as a sectarian one. Perhaps this is the reason that Scottish society has yet to fully realise that the issue in Scotland is becoming more of a football one and less of a religious one. This claim is backed up by study after study that has been undertaken in the last decade. This doesn’t however, make any crimes committed any less serious or any more tolerable. A crime is a crime and should be treated as such. It is clear though that the problem is a sporting one, and labelling it as sectarian is, in many cases, inaccurate. 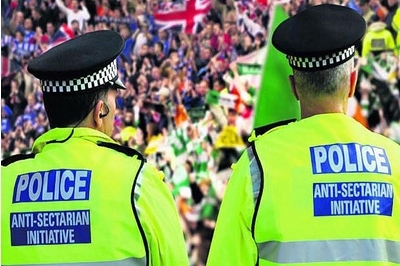 The truth is that in modern Scottish society, ‘sectarian related offences’ are almost exclusively football related. These offences now carry much more of a sporting rationale than a religious ones and people have to realise this if there is to be any progress in the fight against it. This entry was posted in Sectarianism on 30th March 2015 by Chris Main.